Ted Clements, head of design at Antares Yachts is constantly thinking about hull shapes, sheer lines and weight distribution. It is ultimately the obligation of the designer to take care of the customers, even if it means tempering some of their design ideas. Catamaran design came naturally to Ted. 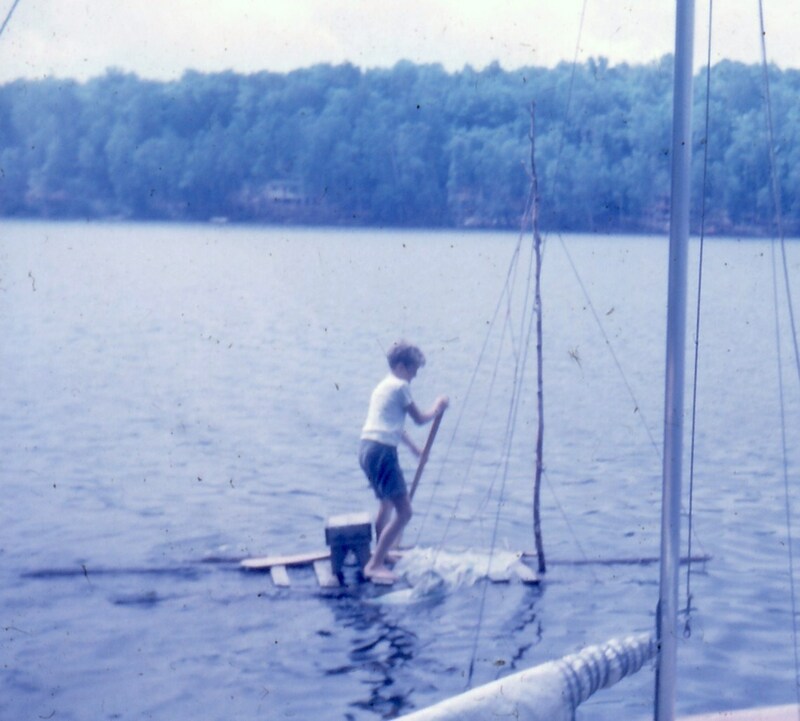 Two saturated logs found on shore, some salvaged boards for a bridgedeck, a shower curtain for propulsion and a wooden crate for a seat, solved a lot of the initial stability issues when designing his first vessel at his childhood cottage. Ted’s career started nearly 35 years ago when he answered a small help wanted ad for a marine mechanic position at the Royal Canadian Yacht Club. While the RCYC had a well-equipped marine yard, Ted quickly discovered that he was “it” – in other words, the only person with technical knowledge in the yard. He had to become the expert in the mechanical field, servicing everything from converted antique steam ferry boats from the 1800’s to vintage Alden ketches complete with teak decks and oval cockpits. Ted later joined a group of partners and established a repair and construction facility that worked on major reconstructions and bare hull outfitting. Harbour Marine was later purchased by C&C Yachts and became their repair division. Ted was involved in major contracts for the rebuild and refit of commercial and government vessels. One of the ongoing projects was a new construction contract to built a series of hydrographic launches of the Nelson 34 pilot boat design. This project expanded to supply other launches of various sizes. Ted’s exposure to designing and building limited production boats gave him lots of experience in refits to coast guard approved passenger vessels by using a reverse process to create a new design, exposing him to stability requirements not traditionally encountered on pleasure boats. A later project involved engineering work for a prototype Arun-class roll-over lifeboat for the Canadian Coast Guard. These boats were to be built out of aluminum and required new propulsion systems, deck layout, hardware and interior fit-out. Ted engineered the fuel/exhaust system details that would keep the engine running safely in the event of a roll over in severe seas. Ted has worked both sides of the fence. He was exposed to catamarans in the 80’s when C & C was involved in the development of a production catamaran for the North American market. Although that project was perhaps before its time and somewhat misguided, later developments have proven the catamaran concept to be a sound one. As far as functionality and performance, it is very difficult to argue with the catamaran hull shape. In the late 90s, Ted was hired to investigate the feasibility of producing a trawler-type power catamaran using an existing 32-foot sailboat hull for PDQ Yachts. He developed the modification in the existing hull form to achieve a target of 12-knots with 2 x 55 hp engines. The prototype fulfilled the requirement, and actually reached 18 knots. This lead to the construction of dedicated molds for a 34-foot power cat. Ted had ultimately designed the most fuel efficient trawler in its class. In fact, Ted has achieved amongst the most efficient catamaran hull designs in the trawler market. At that time, affordable 3-D modeling software was still being developed and Ted began working with a beta version of Rhino. The calculations and mathematics incorporated in the software made it apparent that a computer database was the way of the future. Comprehensive vessel design that at one time took 6 people to design could now be done by one person. When designing hull forms it always pays to observe what has worked historically. When designing a 41-foot power catamaran, for example, Ted paid particular attention to older, narrow entry, semi-displacement hull forms. The result – a dry, quick vessel that didn’t require the complication of spray rails. The 41-foot trawler boasted cruising speeds of 17-18 knots with a burn of 10-11 gallons an hour. Ted began the design work on the 42-foot predecessor to the Antares 44 in 2000. This design was a collaborative effort building on PDQ’s experience in sailing catamarans and considerable input from a strong owner base who gave invaluable field reports. Ted’s believes that ultimately the designer is obliged to temper some marketing driven ideas, such as an exposed helm position which can be treacherous when enduring the hardships of being in weather, or curved cabin tops that are difficult to maneuver around. As Ted explains, the functional line has a proper place in the marine field. You should be constantly concerned about ergonomic and usability issues, both inside and outside the vessel. The standards in the construction and design of the Antares are a result of a long history amalgamating the requirements of working vessels with pleasing aesthetics. You can find out more on the Antares at the Antares Yachts website. First let me commend you on your association with the Antares website. This site is truly the best cat site I’ve seen. I am just starting my quest for a cat to both live on, work from and cruise aboard. I have no experience on multihulls and with the exception that I once lived on my monohull (42 feet) and did go on a round the world trip once, I am not well educated about sail boats – especially multi hulls. I have a close friend doing pretty much the exact thing as I am only he is much more a sailor than I am. He has me, at this point anyway, very interested in an Atlantic 48 or 57. I am going to Annapolis next month to look at one. After reading all your articles and everything on your website I am beginning to expect I may be more of a nester than my friend. He for example sees absolutely no need for an ice maker or air conditioning or a washer/dryer, etc. He is also very interested in a Gunboat 48. My interest is in a boat I can also fish from and carry a high performance tender. I also want a boat that moves quickly under power and has added fuel tanks. I also require a small lab as I plan on collecting, etc. on my voyages. An aft berth converted to a lab seems reasonable to me although I am not familiar with the build process. I am handy, though, as I have built 3 houses and restored 2 Austin-Healey 3000’s. I expect my boat’s lab to have a work area to deal with any mechanical issues as I hope to do any repairs myself. One of the big areas I have yet to understand is how to get a higher speed number under power from a big cat. I hope Antares is at the boat show. I am beginning to realize that if I want to sail single handed I need something smaller than say a 57 foot Atlantic. I tend to jump into things. My first overnight trip on my Harley Davidson, for example, was 117 days and took me to Key West, Alaska, Mexico and Newfoundland. The 4 corners the right way. Sorry, to the point; I just ordered Chris White’s book and was hoping you’d recommend a few others you consider worth the read. I want a cat that is more an expedition vessel than a long distance martini platform. I need speed to fish and I need to address piracy as having travelled through the 2 most pirated areas on the planet I am tired of the “be passive and beg them to be nice” approach. I am not certain what this means. Perhaps arming the vessel or avoiding trouble areas, but it does stick in my mind as I am confident the problem will get much worse before it gets better. I am curious to know what amount of noise comes from 2 volvo 40’s under what looks like just a thin deck board. I do like how you designed the 44i. I have looked at the websites of over 60 cat manufacturers now, and am, with one exception, very disappointed in the lack of information and justification for what seems unreasonable claims. Thank you for plodding through my babble and know that I appreciate any time you can afford me. Marine design is by nature conservative, boats that didn’t bring their owners safely back to shore were not available to be copied. In this respect, deviations from the ‘norm’ are adventursome. Even though some may eventually lead to successful developments, many do not survive. Unless you have a surplus of cash to participate in experimental ventures, you had best stick with what is known to work well for vessels of the type you are interested in. You have probably seen a speculative proposal by a modern catamaran designer that has a peculiar sailplan and masts to match. If this is the article you are referring to, think about the loading of the standing rigging associated with the geometry and try to imagine the real world issues that would ensue. The backstays and masts demanded by such a rig are emburdened with very disadvantageous triangulation angles and sooner or later those loads have to be dealt with by the hardware and the vessels structure. Are you going to engineer and manufacture unique masts with all the attendant hardware and construction details from scratch? Why go looking for trouble potentially greater than the problem you are presuming to solve? There is enough density of issues with a conventional design without adding complications promising only a speculative reward. Forward raked masts are not new but are associated with certain sailplans that are themselves specific to particular craft. The dhow and junk are examples of such craft that have very respected, long standing (1000’s of years) performance records. The designs, though exemplary, have however no identified wide spread application for modern short-handed cruising. Though a few examples may have been successful, their merits were not so overwhelming as to change common practice. Cruising multi-hull sailboats were radically new (and widely disdained) when I was young. That attitude has only been overturned (belatedly) by addressing all the issues comprehensively and demonstrating the merits at sea. As you are thinking about things nautical, it is good to investigate the alternatives. It only takes one factor to put a stop to some particular development and only critical consideration will discover that factor, if it is there. Often seemingly great ideas are presented to us without that due consideration, such is perhaps the case with the forward raked mast and its sailplan (at least the catamaran part is sound). Nobody markets anything by pointing out its weaknesses, you are expected to discover them for yourself one way or another; hopefully not by funding an investigative dead end. Thank you for your quick and informative reply. The more I read your responses and the manner you have thought through (and learned from experience) the needs and wants of catamaran (cruising) sailboats, the more I have come to respect your opinions. I will follow your career and will see you when I can own a boat, again. Just to give myself some credence, I owned and lived on a “Brown Searunner 40” for three years in the San Diego area and I do believe that multihulls (probably Cats) are the way to sail, now.